Hand Painted Bats by Mitchell Bat Co. The grass is cut, the infield is prepped, and come 3:05 this afternoon baseball will officially be back in Baltimore. To say we are excited would be a bit of an understatement; we’ve been counting the days until Opening Day since last October. 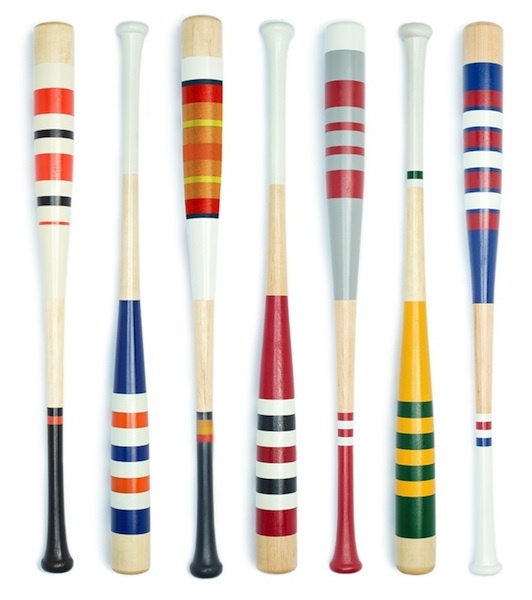 If you’re as excited as we are that baseball is back, we have a feeling your going to love the hand painted bats from Mitchell Bat Co.
Made from maple, these bats aren’t the best pick for a game in the sandlot, but they are a fantastic addition to any office, man cave, or sports themed room. Inspired by both current and classic jerseys and team color schemes, each Mitchell bat is hand painted and if your favorite team isn’t represented yet custom orders are welcomed. Not only will you be getting a unique piece of art when you purchase a Mitchell Bat Co. bat, you’ll be helping a great cause, a portion of all proceeds goes straight to the MLB RBI program. Enjoy the season everyone, here’s to hoping your team has a great one (unless you are a Yankees or Red Sox fan).